Strawberry Road: TGF Release Day Blog Hop!!! TGF Release Day Blog Hop!!! "Abbey" & sentiment from The Greeting Farm. HELLO and WELCOME to our MAY release at The Greeting Farm! We have LOTS to be excited about today as we have a NEW contest, NEW line of stamps now available for purchase in the store, and a NEW Guest Designer! Please welcome again Jessie Rone, our May Guest! And now, it's time to welcome the following new characters to the TGF LINE! We have another HUGE ANNOUNCEMENT for you today. Announcing our 2nd annual "CARDS FOR A CAUSE" event! Last year you really brought us to tears and smiles on our faces with our 1st card drive. Due to it's success, we are rallying the troops again for a 2nd one and well, we're making it ANNUAL! This year, we were moved beyond measure with so many emotions for the people of Japan as we watched live video of the earthquakes and tsunami that devastated so many people on March 11, 2011. It broke my heart to see videos of families in shelters, children looking terrified and not understanding what happened. Some of those families lost everything and when our loyal TGF customer Natalie Shaw emailed me a link to a school that we could send in handmade encouragement cards for children, we knew this was going to be something TGF wanted to be involved in! Our images are PERFECT to cheer up a child and we really hope you will play along! Please view the tabbed page on the TGF Blog entitled "Cards for a Cause" for all the information on how YOU can help...and possibly, WIN some serious loot from TGF! PLEASE JOIN US! As for 'loot' today, well, you know the drill! ONE lucky commenter who completes the hop and comes back to the TGF Blog to leave a comment will be drawn to WIN the ENTIRE May Release! You will have until 11:59 pm CST TONIGHT to comment and become a follower and we will happily announce the winner tomorrow morning on the TGF Blog! GOOD LUCK, ENJOY and HAPPY RELEASE DAY, everyone!!! If you have any questions about my card or technique, you may email me at buttercupblogs at gmail dot com. Wow, great card. Abbey looks amazing against your colour background. Love how you have her looking up at the birdie, cute layout. Your coloring of the images is very different from what I've seen. It's a different feel and I like it! Your card is sooo adorable. Thanks for sharing! Lovely card buttercup! :) I love the vibrant colours, Abbey just looks awesome & your little birdie & sentiment are just perfect! Wow your cards look amazing as always. Such fun and vibrant colors, love it! Lovey colors!. I like the birdie. Great! Gorgeous card with wonderful colours. Super image and details. Thanks for a great hop and the card drive is such a great cause. I love Abbey so much and your card is really cool! I love the colors you used! 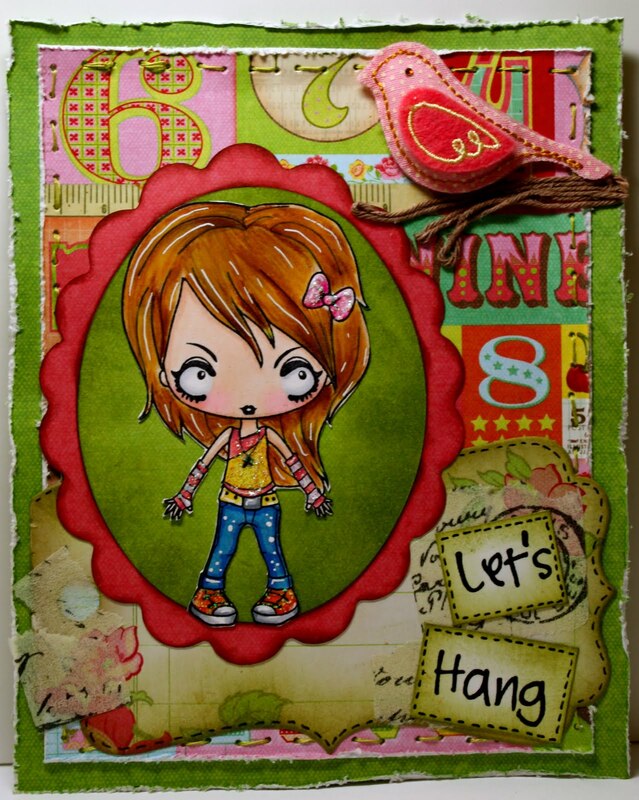 gorgeous card I love the way you have coloured her up her hair looks great. Lovely card, and that birdie is so cute! Not only is the dollie too sweet but I love the sentiment - TFS! Love love love Creeper Abbey! She's adorable! Love your work- it's great!!! This image just Rocks... I like how you have her looking up at the bird!!! Ooohh How fabulous does Abbey look, Love her Rock star glitz and Glamour! Awesome card Buttercup! Beautiful card! I love the coloring. I love it! So colorful and fun Thanks for sharing. This is such a fun and colorful card, also great job at coloring her !! Abbey is my new favorite stamp. Fabulous card. Soooo adorable! Love this little creeper! Great card and great coloring! This is one beautiful and inspiring card. Love the dp, the little girl and your coloring. FABULOUS new release and creations! Your card is so colorful in true Buttercup fashion - TFS! I just love how you colored her hair! Such a cute card! Gorgeous color combination and love the bird! wow! i love all the texture you create on your cards. Love your card! The white highlights are awesome! WOW, girl your coloring is AWESOME and she looks SO cool w/ the colors you chose! Fantastic card! Awesome! As always your colors are stunning! 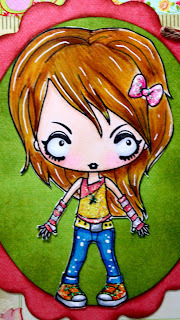 I adore your coloring on the little creeper girla nd your card design is amazing :) Fab colors! Oh she's cute! Beautiful, fun card! Oh, she is simply stunning! I just love those jeans and the white splotches you added! Another fun and colorful great card. Fabulous coloring!!! And im loving her homemade jeans with the painter splotches. Abbey can def rock those. The TGF image is great! Introducing "Hoo Loves You" by TGF! A Colorful Card for a Colorful Friend! Throwback Thursday with TGF's Cheeky Rockabilly!